Rachel Held Evans has been called “the most polarizing woman in Evangelicalism.” She is a New York Times bestselling author of three books and a popular blog in which she wrestles honestly with the cruelties and contradictions in her Christian tradition from the standpoint of a loving insider on a quest to understand God and goodness more deeply. Her most recent book, Searching for Sunday, brings readers along as Held Evans, still a self-identified Evangelical, explores and embraces the liturgical ritual of the Episcopal tradition. It is a loosely connected collection of musings structured around the seven traditional sacraments of the Christian tradition: baptism, confession, communion, holy orders, confirmation, anointing of the sick, and marriage. In this interview, Held Evans discusses both the book and her broader faith journey. Tarico: My readers know me to be post-Christian, a self-described spiritual non-theist and ardent critic of the Evangelical fundamentalism in my own roots, and I write largely for an audience of secularists and former fundamentalists. So I may take some grief for this interview. But I am fascinated by your journey and your labor to create space for growth within the Evangelical tradition. What has kept you in the fold? Held Evans: I still see value in church and Christian community. Christian community can be hurtful and wounding and cruel, but it also can do a lot of good and be healing and show a lot of grace. It can be helpful and healing. Not all churches are bad. A person can simultaneously acknowledge that the church does incredible wounding but the church can also do incredible healing. Christian people can hold both of those things to be true. People can romanticize the church and demonize the church and treat it with cynicism. As someone who tends toward cynicism, I’m trying to be truthful. Tarico: Some fellow believers see your questioning and critique as a betrayal of Evangelicalism. But in one of your recent blog posts, “Strong enough to be self-critical: In America and the church,” you came down hard on the side of criticism as a sign of love and loyalty. You said, “Mature people and mature communities are strong enough to be self-critical and wise enough to speak the truth in love.” Are there limits on that? Held Evans: A lot of cultures set limits on how much you are allowed to ask. They encourage curiosity and questioning up to a point but your answers need to fall within a certain framework of what the answers are supposed to be, and I think I pushed up against that one too many times for some critics. Criticism can be hard to do well, and I am often clumsy at it, but those who advocate for reform in the Church often do so out of a deep love for it. I want the Church to be a more hospitable place for LGBT people, precisely because I want the Church to grow and thrive and welcome all of God’s children through its doors. I want the Church to embrace science precisely because I want the Church to remain relevant in the world and tenable for those who shouldn’t feel like they have to choose between their intellectual integrity and their faith. In my work, I feel it’s important hold both the good and the bad of my faith tradition truthfully, candidly. If I weren’t deeply invested, I wouldn’t care. I wouldn’t speak up. Tarico: So if not criticism, what do you perceive as the greater threat today to Evangelical Christianity? Held Evans: I’ve long felt that if evangelical Christianity continues to align itself to a single political party, the danger will be that it will rise or fall along with that political party, that it will assume the identity of the Republican Party rather than the identity of Jesus Christ. I think we’re seeing some of the fallout from that, as Evangelicals are growing more defensive and defeatist as they lose political ground, particularly in the so-called “culture wars.” But I also see this as an opportunity for Evangelicals to have some tough but important conversations about what it means to be evangelical, to be Christian, in the U.S. If it’s not about winning elections and maintaining power, what’s it about? Maybe it’s about loving and serving the culture rather than trying to control it. Tarico: Anthropologist Jennifer James has called fundamentalism the “death rattle of the Abrahamic religions.” How do you see it? Held Evans: I grew up in the buckle of the Bible belt in a conservative Evangelical church with conservative Evangelical parents, and I have almost entirely fond memories of that experience. I would be very cautious of painting all fundamentalists as hateful, closed minded ignorant people. It’s just not true. I’ve seen conservative Evangelical Christians love one another in really beautiful ways. You see the whole church rally around a mom who needs chemo—making meals, taking care of the kids. I was loved very well within that tradition. My parents modeled what it means to be gracious. I recognize that might have been different if I was gay. I’m aware that being me came with some privilege. But I am wary of painting people broadly with this brush of closed-minded judgment. That said, people do get really stuck—in patriarchal hierarchical marriages for example. Christianity has produced some destructive narratives. I criticize and talk about that because I love the Evangelical community and have incredibly strong warm feelings toward it. That’s why I care that things are not always what they should be. I wouldn’t care if I didn’t also see value in it. Tarico: Let’s talk a little about marriage, because it seems that two of the issues you have really wrestled with are the role of women in Christianity, and the question of dignity and equality for LGBT people, including marriage equality. Held Evans: I don’t agree with Christians who think that what makes a marriage sacred is a man and a woman with a man in charge. What makes a marriage sacred is not conformity to social norms, not how well you fit the Ward and June Cleaver model, not patriarchal hierarchy, but the degree to which there is love and self-sacrifice like we see in Christ, in that relationship. My aim is to say that what makes a marriage sacred and special and life-giving is that mutual love and concern and giving. Tarico: For some who criticize Evangelical Christianity from the outside, who see it as harmful, what they find most untenable is orthodox Christianity’s exclusive truth claims, the claims that are laid out, for example, in the early 20th century pamphlets “The Fundamentals” that became the basis for our term fundamentalism. Worst, maybe, is the idea that anyone who isn’t an insider is an evildoer who lacks a moral core and is condemned to eternal torture. I say worst, because this is an idea that through history has opened up all manner of mistreatment toward outsiders. After all, burning someone at the stake is peanuts compared to burning them forever. Held Evans: I understand why people wouldn’t want anything to do with the Church, I really do. But not everyone reduces faith to where you go when you die. Historically that has been a problem, but not every Christian has reduced Christianity to that. Not every Christian believes that everyone who doesn’t believe as they do is going to hell. Christians often act like they don’t understand why people doubt. That can make us seem really detached and checked out of reality. Something I like about the Episcopal tradition is that it focuses on the mystery of faith: Christ has died; Christ has risen; Christ will come again. There are days I struggle to believe that literally, and there are days when it’s easy. But there is something unique and special about the teachings of Jesus and committing ourselves to following those teachings. As to exclusivity, I believe people can embrace Christian belief and do Christian things without assuming that God isn’t present in other traditions or that we have nothing to learn from outsiders. I can hold my own tradition with conviction and respect and still think it possible to learn things from my Buddhist neighbors. I enjoy reading atheist and agnostic blogs and learn a ton from their honesty, for example. We don’t have to choose between conviction coupled with strong faith identity and openness to learning from others or acknowledging their spiritual insights and shared humanity. Tarico: Your focus on the sacraments is interesting because it strikes me as a move away from belief—from belief-ism toward a focus on practice or praxis, more akin to Dharmic traditions, like Buddhism, and more mystical traditions within Christianity itself. Held Evans: Much of my evangelical Christianity was an assent to propositional truths. Christianity was something you believed. I’ve come to understand Christianity even more as something you do. It’s sharing communion not just around the altar but around the table. It’s anointing the sick—that’s not an effort to cure someone like a magic charm. It’s acknowledging someone else’s suffering and saying I am present and I am here and we can find god even in this. That is what it means to be Christian and a part of the church. Being in community and experiencing god in that community. The sacraments make that possible. Tarico: When I think about what it means to be Christian, I’m struck by the bifurcation between liturgical and other traditions. It seems like the churches that have kept the traditional order of worship and liturgy have been more free to explore theologically, while for “Bible-believing” denominations, the thing that is immutable is the theology, which frees them up to be entrepreneurial about music, buildings, outreach, and the order of the worship service. So it’s like people can creatively explore the order of service or they can explore theologically – but not both. Held Evans: I’m still exploring why the sacraments are so powerful for me personally, but that’s part of why I was drawn to the liturgy. The culmination of the typical Evangelical worship service is the sermon—the preacher’s interpretation of the text. In a more liturgical service, the climax is the table, gathering for communion. There is something mystical and ever-giving about that. It is centered around the community. It is also something very open to interpretation and people take different things away from it. In an Evangelical church, people will say “I didn’t feel like I got fed today” as a reference to the pastor. In a liturgical tradition you never say that, because you are fed the communion—the body of Christ. Liturgical traditions give us more space to explore belief, because what unifies us is not shared belief but shared experiences. Tarico: Let’s talk about the Bible, the center and source of those Evangelical sermons. When I look at the Evangelical tradition I grew up in, I think that the Bible has become a golden calf. The Bible has human handprints all over it and yet people treat it as if it had the attributes of divinity: timelessness, perfection, completion. In an age of the written word, what better golden calf than a golden book? I think of it now as a form of idolatry. How do you see it? Held Evans: What troubles me is the notion that we can somehow read a sacred text without interpreting it. People say they are just reading the text. That’s not possible. The idea that we can approach a text without bringing our imperfect often greedy often selfish selves to it. It’s crazy to think that anyone is claiming simply to take God at his word. Tarico: So how do you think about approaching the Bible? Held Evans: The tendency is to accuse one another of picking and choosing. Of course we do! But how do we pick and choose in a way that is healthy and life giving? What method or metric should we use for doing that? As a Christian, as a follower of Jesus, I think it’s appropriate to think of Jesus Christ as the fulfillment of scripture, that in his life and death he put into practice what scripture was meant to teach us. It seems to me that I can take my cues from how Jesus interacted with scripture, which was always life giving. You have heard that it was said, ‘Eye for eye, and tooth for tooth.’ But I tell you, do not resist an evil person. If anyone slaps you on the right cheek, turn to them the other cheek also. And if anyone wants to sue you and take your shirt, hand over your coat as well. This offers an illumination of how to approach scripture. When Jesus was asked by experts on scripture what is the most important commandment, he said, Love the lord your God with all your heart soul and mind and love your neighbor as yourself. All the law and all the prophets land on this. The whole point of it all is love. If we take that posture when we approach the text—To what degree does this help us love God and each other better?, that is a helpful life-giving guide. If Jesus interpreted scripture that way, that’s how I hope to interpret it. If you are going to scripture to look for a weapon you’ll find it. If you go to scripture looking for healing balm you’ll find that too. So much has to do with what we’re looking for. If we want to use the Bible to hurt other people, we can. If we want to use it to promote healing, hope, love and grace it’s there. Tarico: Many Christians would argue that the Bible is the final arbiter of any doctrinal dispute; you are saying that the model of Jesus is the final arbiter, the lens through which people need to read scripture. Held Evans: I believe the Bible is authoritative in Christian life, but that we interpret Scripture through Jesus, who is the ultimate expression of God’s will for us. The notion that we experience Christ only through the pages of the Bible isn’t even biblical! We encounter Christ in communion, in the needs of people who are suffering or hungry, where two or three are gathered in Christ’s name, and so on. When we care for those who are suffering we experience Christ. God speaks to us through all of sorts of ordinary, everyday things. In a similar way God speaks to us through scripture–through imperfect words. The idea that God is too good to speak through imperfection is mistaken. God uses all sorts of everyday things to reach out to us. Tarico: I’ve heard the natural order described as “God’s other book.” I guess that would include our experience of each other, of love, community, suffering and healing. It also includes the natural world, including the laws of physics and biology and genetics that increasingly are being unveiled by scientific inquiry. Any thoughts on that? Held Evans: All truth is God’s truth. If something is true, then it’s true. If the universe is billions of years old and humans share ancestors with apes, then that’s the truth. God can reveal himself through science. More and more even in the Evangelical world I sense there is openness to what the natural world has to teach us. Evangelicals don’t have a great record. There has been science denialism, but I think there is common ground. Denialism is based in fear, but we don’t need to be afraid, and in fact, this fear is such a denial of the core of Christianity. 1st John 4 says, Perfect love casts out fear. Fear is not a healthy way to view the world, and it’s not a healthy way to view and approach our faith. You cannot love God and be afraid—afraid of the world, afraid of a Bible that isn’t how we think of as perfect or afraid of new discoveries and information. Christians are called to be or do something more. Tarico: Back when I was a college student at Wheaton, I remember reading an assigned book with the title, Your God is Too Small. I now find that even the god-concept proposed by the author seems too small, too modeled on humanity. 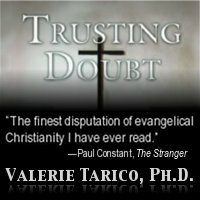 But the title—the concept—stuck with me, as I discuss in my own book, Trusting Doubt. It seems like you are working to articulate an understanding of Christianity that is big enough to be compatible with both compassion and tradition, and what we know about ourselves and the world around us. Held Evans: People fear this God who punishes everyone who is wrong. Really?! We’re all wrong about lots of things, even small ordinary things. When we’re talking about the nature of ultimate reality, we’re going to get some of this wrong. If I thought that God vindictively punished everyone who was wrong, I’d be afraid all the time too. (In fact, I used to live that way and I remember that fear; and it’s really nice to live differently.) Why is it hard to believe in a god who is big enough and kind enough to forgive us for being wrong? Tarico: They say a book is out of date the moment it is in print. What are your biggest a-ha’s since you finished writing Searching for Sunday? Held Evans: I feel that way about the other books, but not about this one yet. I’m still in the Hey, World! stage. I started writing in my 20s and I’ve wondered if I would regret that. But I say to myself: Rachel, if your last book is completely different than your first book then I think that will be a completely successful life. I’m looking for readers who are waiting to evolve and come along with me. If I waited till I had it all figured out I never would write. I hope I am a different person in twenty years –that would mean I stayed open to change and humble and self-critical, which for me is part of how I aspire to grow in grace and in the love to which we are called by the model of Jesus. Gallery | This entry was posted in Musings & Rants: Christianity and tagged biblical literalism, bibliolatry, Evangelicalism. Bookmark the permalink. Thanks for interviewing Rachel and asking her pointed questions. Kudos, Valerie! A great person to interview and a great interview. I’ve been following Rachel some since nearly when we both started blogging, before her first book. We interacted via her blog and also a little in person once…. And she, already open/exploring then, has become a careful, mature thinker and remains a very caring person. Fortunately, her elevation as a speaker and writer signals some very hopeful changes in the mindset of especially younger and educated Evangelicals… and many, as you know, have taken even more “reformist” paths. So I see Evangelicalism being dragged, with some kicking and screaming, toward more mature understandings and a return toward the teaching OF Jesus, not just ABOUT him (with some monstrous abstractions added in). Still, many struggle to find healing and/or intellectual consistency. Her way of structuring belief and “faith-life” in relation to broader life and community can be helpful for many of them. It can also be helpful for the severe critics who can see virtually NO good in any traditional form of Christianity. Lots of good insights in your interview! I’m going to re-blog it with a short intro. Thanks again. If you’re not familiar with both Valerie Tarico (interviewer and author) and Rachel Held Evans (interviewee and author), you should be! I know them both a little and it’s wonderful to see them interacting. This interview is loaded with wisdom and hard-gained insights. I stopped identifying as Evangelical many years ago, unlike Rachel, but I grasp and respect her stance, given its openness, thoughtfulness and graciousness. People like her are very valuable in the process of helping many others either mature and become more healthy in their faith or gracefully transition to a belief-system and type of community that fits them better (including leaving “religion” entirely). As an atheist, I am often asked, “Why do you criticize religion? Even if none of it is true, it still gives people hope.” At what price? Where would we be if Jonas Salk had simply “hoped” that a benevolent god would cure polio? Great article Valerie. I like Rachel’s approach which I see as universally applicable in all situations where we look for more caring and supportive lives. Sha’Tara, I don’t know what all you’ve observed and studied that informs your perspective. But if it doesn’t include much developmental psychology and psychology of religion and spirituality, I’d encourage you to look at a few such resources. Among the most helpful is a great analyst/thinker who is basically non-religious but understands the crucial role the “major world religions” play in societal and global development: Ken Wilber. His call, particularly in “Integral Spirituality” (not his “easiest” book for those unfamiliar with his AQAL system), is for religious people to allow themselves and their communities to move up the developmental scale. His metaphor is religions as a great “conveyor belt” to help move all of humanity to more universally-oriented and integral (or whole/integrated) thinking and ways of being. And religions DO evolve (despite many Evangelicals denials that “true Christianity” does). They can and do help, in many cases, people survive, grow and thrive and manage to improve society along the way. And if traditional Christianity (Evangelicalism being a sub-set of it) were to “rust away” and virtually disappear, people would fill that hole with another, potentially LESS evolved version of Christianity. It’s part of an individual’s developmental process. Unfortunately, many people stop after rung one or two. But Rachel Held Evans seems to continue to grow and develop, and realizes she is not done yet (and I think she’s only around 34 years old). If Wilber’s work doesn’t much appeal or make sense to you, a book on his basic stage concepts that is applied specifically to Christianity is “Integral Christianity” by Paul Smith. This one is very readable. Even if you don’t agree with much of it, you will get a very helpful education from it…. I’ve studied both psychology and theology (along with anthro, sociology, history, general science, etc.) for nearly 50 years and I found new insights and a helpful framework in it myself… it ties together many important strands of various traditions and practices (not just Christian) that are seldom if ever combined and made sense of elsewhere. Very interesting. Readers might want to check out the “Rethinking Biblical Christianity” website blog by Peter Enns on the same book. I am going to his blog to suggest that readers there check out this blog. 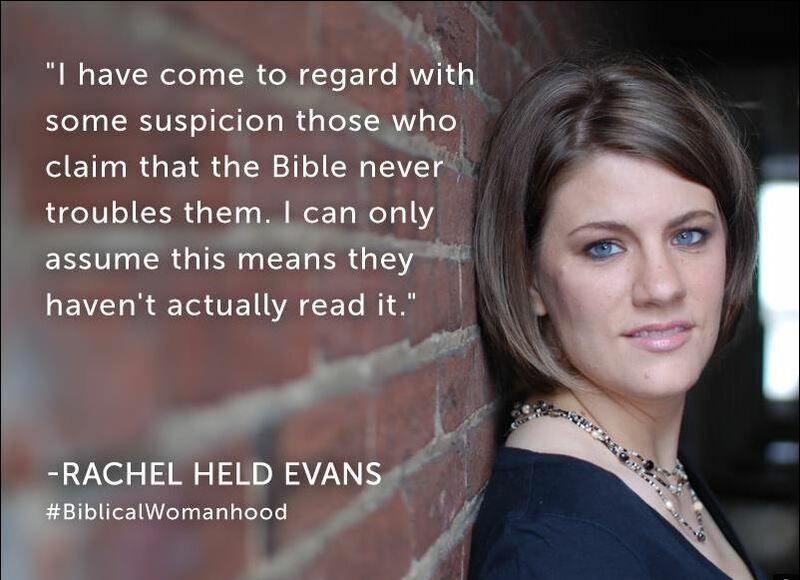 I find Rachel’s answers very genuine and without conceit toward non-believers, such as myself. A point I’d like to emphasize is that all the positive social and personal aspects of religion are available from secular sources and without the limiting baggage of dogma. Religion is often there to meet our most basic needs, but that in no way implies that its claims of special knowledge is true or even healthy. Thanks to both of you for a very honest interview. Process philosophy/theology (best kept theology “secret”) is an example of “Christian” (very progressive) thinking that is both intellectually creative and practically applicable. Key example: In June, Process people in conjunction with some “sustainability” folks are sponsoring a major conference called “Seizing an Alternative: Toward an Ecological Civilization”. It should have massive educational value, and I expect will spawn more than one important new action-oriented venture… I will BE THERE aside from almost anything short of death! You might enjoy seeing the range and depth of this large conference at http://www.Whitehead2015.org. Can Evangelical Christianity Be Saved from Itself? As a former evangelical I look back in embarrassment at my arrogant, absolute certainty that my ignorant beliefs were actually truths, and tried to convince others to believe like me. I applaud her courage to be like a bridge of light in this world, from the ‘black and white’ thinking paradigm of fundamentalist thinking, to a more expanded view, which even the early Gnostic Christians embraced. The image of God in the old testament, for example, is a projection of some of the characteristics of each of the writers, so thus the ‘human’ element, and why sometimes God is portrayed in conflicting ways with contradictory character. It’s an offshoot of humanity’s collective evolution–as we ‘grow within’ so does our conception of “God”, and thus the doctrines get ‘edited’ accordingly. To deny that is deny repeating cycles of history. Also, we must be careful that we do not use our personal projections of God to be used to harm one another, as unfortunately has indeed often happened as she mentions (and yes also there are diamonds in the dirt” as it were, among it all and good has also been done as well.) Excellent, I look forward to the book! I don’t need a PhD in psychology or to have read as many books as Howard Pepper to tell me that Rachel still believes because she wants to. Billions of human beings do likewise (though thankfully not in evangelical Christianity). Some of them might even believe something that’s true, although my guess is we’re all wrong. However, is she really an advocate for evangelical Christianity? Doesn’t sound like it to me. But of course, like Christianity itself, who is to say what constitutes evangelical Christianity?